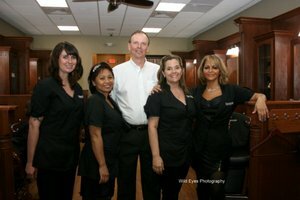 WELLINGTON, FL--(Marketwired - Mar 24, 2014) - Wonder what men talk about when getting their hair cut? The experienced hair care professionals at Roosters Men's Grooming Center (MGC) in Wellington can tell you. This was a question recently asked of participants on "Let's Ask America," a new interactive TV game show. They were asked to select from one of four responses polled during a survey of men getting their hair cut. The options were work, hair, sports and politics. "Our team knows the answer -- it's sports," said Bob Rourke, owner of Wellington's new Roosters MGC who acknowledged there may have been a little more political talk than usual this month. "We coincidentally chose a busy election day to host our store's grand opening celebration. Members and staff of the Wellington Chamber of Commerce really came out of their way to make us feel welcome before they headed to the election parties." During the celebration that included refreshments and prize drawings, visitors relaxed in Roosters' oversized leather barber chairs and met the store's team of experienced barbers and stylists. Roosters' custom services include precision haircuts and shaves with hot steam towels, deep cleansing facial massages with moisturizing lotions, and exclusive Aveda products for men. The last item on the store's menu of services is "advice on golf -- for what it's worth." Located at South State Road 7, next to Men's Wearhouse, in The Plaza at Wellington Green, Roosters MGC is open from 10 a.m. to 9 p.m. Monday through Friday, 9 a.m. to 6 p.m. Saturday, and 12 noon to 5 p.m. on Sunday. To schedule an appointment or purchase a gift card, call 561-798-0606. Walk-ins are always welcome. Roosters MGC in Wellington is one of more than 70 franchises nationwide and the third to open in Florida. The first Roosters was opened in Lapeer, Mich., in 1999 by Master Barber and Founder Joe Grondin, who strives to give customers the best in men's personal grooming services to ensure the experience brings you back. Roosters MGC is part of the worldwide family of Regis companies. For more information, visit www.RoostersMGC.com.